CatEye has been producing innovative cycling technology for over 60 years. As more vehicles enter the road each year and our streets get louder and brighter, cyclists have trouble competing with more lumens alone. Riding and lighting smarter is key. This is why CatEye produces a wide range of products with dedicated solutions for riding both day and night. Different cyclists have different demands. When it comes to something as important as lighting, be prepared to ask questions. Is your cyclist riding during the day? Night? Both? Are they commuting, road, or mountain biking? What is the best way to mount their lights? Is helmet, handlebars, or on their person the best method? If you are going to recommend a product as a solution to a problem, carrying a range of products that provide different solutions is essential. The Rapid X line of safety lights attaches to the bike using a comprehensive set of bands, allowing a cyclist to attach the unit to a variety of locations including the seat post, chain stay, and rear rack. The Wearable X, with its built-in clothing clip, can attach just about anywhere. 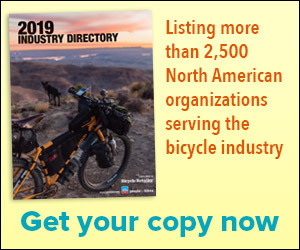 Using the included bands, attach it on more traditional locations as the seat post, or simply clip it to a to a jersey, backpack, seat bag, the rear of a helmet, running shorts, or their trail pet’s collar. We believe that optimal visibility is not only being brighter, but being smarter in how lights communicate. This concept is integral in two of CatEye’s products, the SYNC lighting system and the Rapid X2 Kinetic. 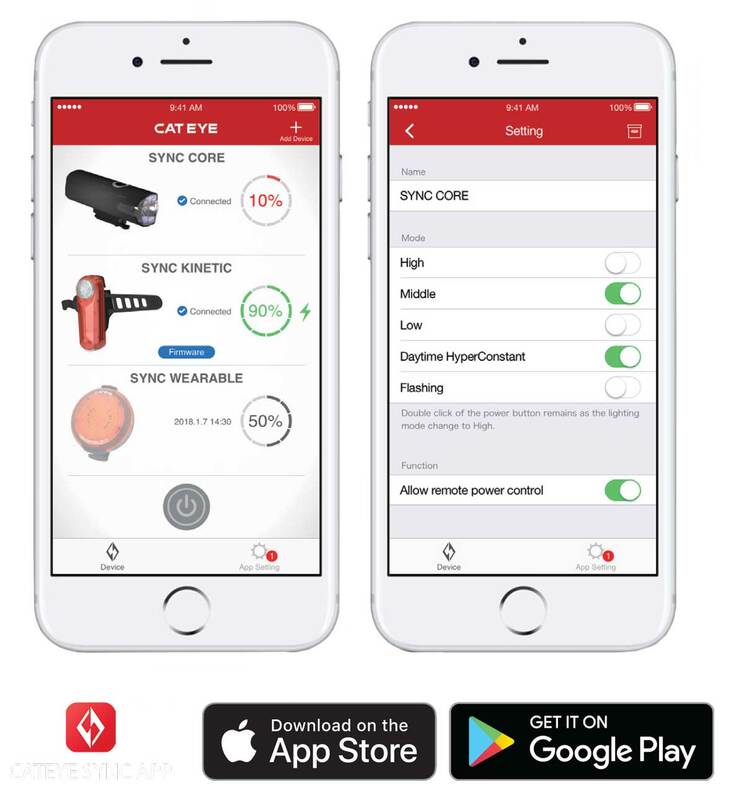 SYNC is a lighting system that uses a smartphone or the SYNC headlight to control all lights, synchronizes flash settings in several modes for maximum visibility, and can connect up to seven different lights. SYNC your can control your rear light flash timing for optimum visibility to other vehicles on the road, day or night! 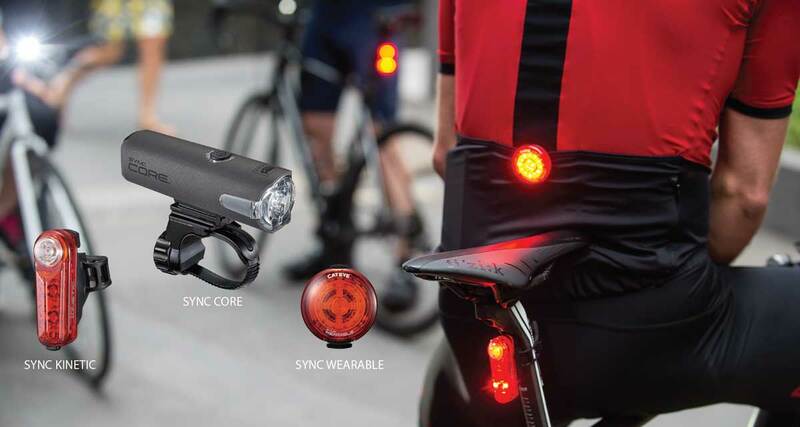 The Rapid X2 Kinetic is a great rear light for road riders and commuters interacting with traffic. While a hand signal gesture or “slowing signal” can be dangerous, this smart light will automatically change from Flash setting to High mode constant when deceleration is detected. Whether carrying just a few items or stocking our comprehensive line, we want to make it as easy as possible for our dealers. Product information pamphlets, display hooks, ORB counter POP displays, Rapid Kinetic X2 POP and our newest SYNC system wall POP are just a few options to make stocking easy and information accessible. When your customer has questions about products, consult any of these display resources, or call our sales and customer service reps at 1-800-5-CATEYE. How to stock lighting solutions for any customer. Safety lights vs high lumen lights: Stock light options in both categories for front and rear. When it comes to lighting, the first question you ask your customer should be whether they want to be seen or to see. Placement: Does your customer need a light that adapts to more than your seat post? Be prepared to offer lights with versatile mounting positions like our Wearable X and Rapid X line. Discipline: Not every customer coming through the door is going to be biking with street lights. Road cyclists and mountain bikers riding at night will be turned off from night riding if not equipped with a high lumen light to keep up with their pace. 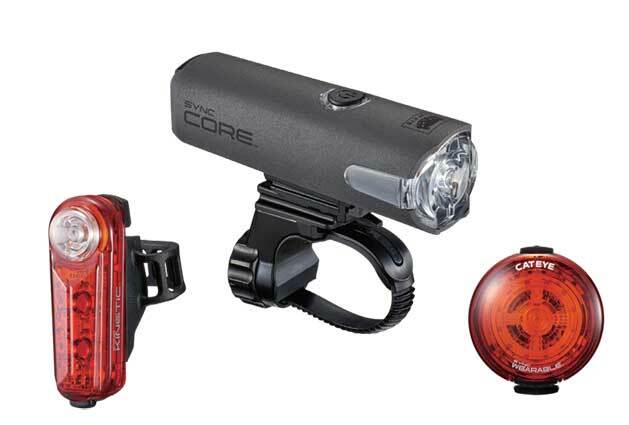 Stock and recommend front lights with 500 lumens or more to keep your cyclists confident. Performance: CatEye lights test with a result of better run times against other major lighting manufacturers. Is your customer biking long distances, or in the cold? More lumens aren’t going to matter if their battery life and run time is suffering. Customization: Some customers want options in functions without the maintenance. Stock lights such as CatEye SYNC that can be customized to your customer’s preference. Don’t just sell for the night time! Most accidents occur within the daytime. Do your customer a favor and recommend a safety light even if they are planning on riding mostly during the day. Control all SYNC lights using your smartphone or the SYNC Core headlight. Activate Kinetic mode to increase rear light brightness when deceleration is detected. Synchronize rear lights to flash in unison. Monitor battery life of each light. Control up to seven lights.